Spanish composer Fernando Sor began his career writing opera ballets, oratoria and other forms of orchestral music. 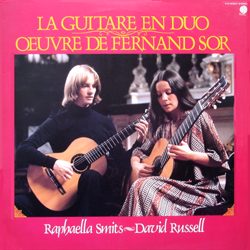 After he settled in Paris in 1827 Sor composed 4 books of études, 12 guitar duets and 18 other works for guitar. No more Italian arias, only some bolero's, French songs, ballet music and a few instrumental works, ... besides his performing and his teaching. He was worldwide recognised as one of the most important guitarists of his era. For this recording Raphaella and David play alternately melody and accompaniment, which makes the duets more exciting, both for the performers and for the listeners. Born in 1902 in Romania, Armin Kaufmann's musical style can best be described as neo-classical. His works include many songs and chorals, symphonic music, chamber music, stringquartets, etcetera. He wrote ten guitar pieces, a suite for guitar, a trio for guitar, violin and double-bass and several compositions for mandoline and chamber orchestra. "Dear David and Raphaella, I have been so pleased to hear your recording. You play with perfection and sensitivity. Your two guitars sound like one instrument. I like your musical strenght. I send you both all my congratulations and my love." "Russell and Smits teach us the meaning of perfect homogeneity." "A very homogeneous duo. The striking similarity of their technique, their intention and their sensibility makes it impossible to distinguish one from the other"
In Japan this record was published by Overseas Records/Teichiku Records Co. Ltd (KUX-3265-V). There it had the Sor pieces only and another cover.